I'll be honest: The first time I ever visited an infrared sauna was because I was simply feeling too lazy to actually work out. I figured sweating in a small room kinda sorta counted as exercise. Plus, I already frequented hot yoga classes on the regular and can attest that nothing feels quite as euphoric as leaving a hot room knowing you fully put your sweat-wicking leggings to the test. 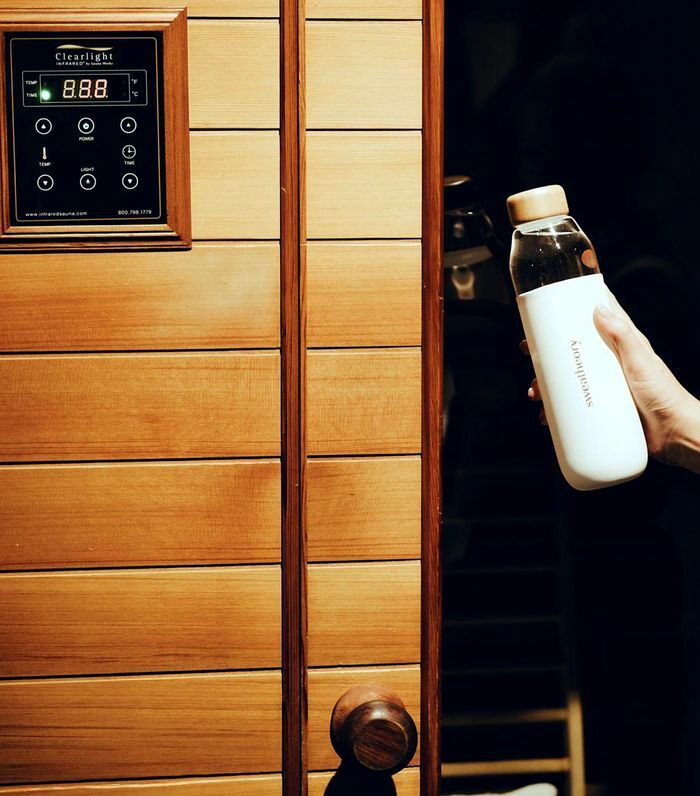 Living in Los Angeles, aka home of bio-hacking gyms, CBD-infused lattes, and the infamous Erewhon market, means that my apartment is mere minutes away from the local infrared sauna studio known as Sweatheory. The posh studio, which offers even more typical L.A. activities on its menu like vitamin injections and angel card readings, makes you feel like you've walked into a wellness wonderland the moment you step in. After being greeted with a cayenne shot (to kick-start the heat, apparently), I was escorted to my own personal sauna room where I was assisted in hooking up the Bluetooth so I could listen to my favorite podcasts during my session (using your phone inside the sauna isn't exactly recommended, nor hygienic). Fifty minutes—and tons of water breaks—later, I was feeling good. Like I just went on a five-mile run and am still feeling the high good. Was it just the fact that I detoxed from my phone for nearly an hour and utilized the calming lavender-soaked towels given to me as I left? Or was there actually something to this whole infrared sauna thing? I decided to chat with an expert and find out. Keep reading for some of the health benefits of sweating in an infrared sauna. Probably one of the biggest things that I noticed after my sweat was how good my skin looked. As someone who has struggled with adult acne and frequent redness, that's really saying something. All of the blind pimples that had been buried beneath the skin prior were significantly smaller and many of my blackheads seemed to have magically disappeared. Similarly to how your pores open after taking a nice, hot shower, the infrared sauna can improve the appearance of your skin by helping clear out any dirt or impurities that often clog pores. 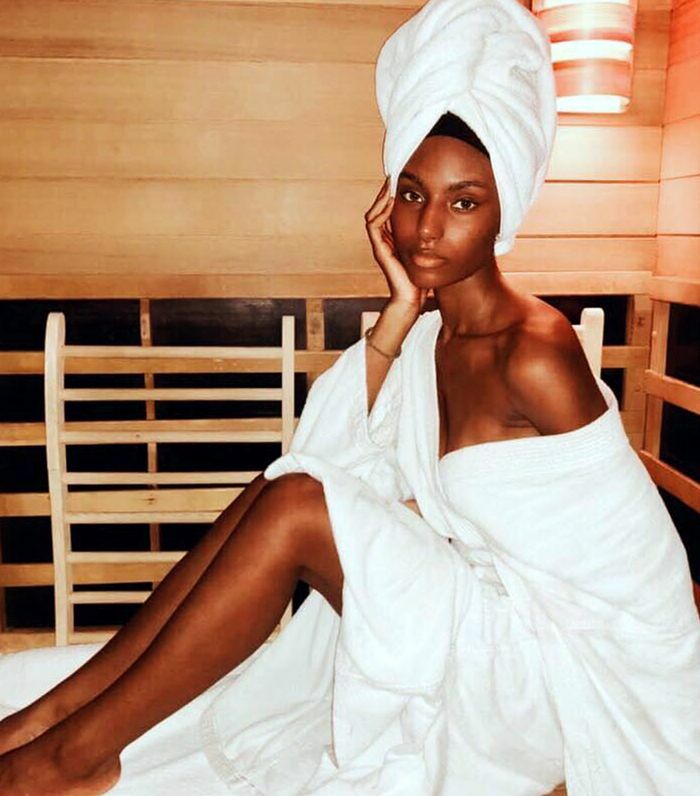 "Our bodies naturally store harmful toxins and heavy metals, and our infrared saunas can help remove these impurities in your cells to aid in skin rejuvenation and overall wellness," says Olivia Doneff, creative director of Sweatheory. Olivia also suggests continuing to take care of your skin post-sweat by bringing along a facial oil or lotion to hydrate the face afterward. You can also rest easy knowing that sitting in an infrared sauna won't damage your skin. The wavelengths heat your body up from the inside, without exposing yourself to harmful UV rays. Remember when I said I was too lazy to work out? While sitting in a sauna for an hour definitely does not compare to a typical workout class, it was pretty interesting to see how quickly my heart rate skyrocketed and the sweat began to pour. After about 30 minutes, I truly felt like I was putting in much more effort than just sitting down listening to a murder mystery podcast. Since your body is working so hard to produce sweat and cool your body down, it truly can feel like you're working out and may even aid in fat loss, according to this study by Binghamton University. Infrared saunas aren't just beneficial for your physical health; they also benefit your mental and emotional health as well. First of all: I can't recommend spending an hour sitting alone in a room without your phone enough. Getting some time to really sit with myself without any sort of distractions was a great mindfulness practice and resulted in a clearer, less cluttered mind. But besides the forced digital detox, my emotional state felt similarly to how I feel post-workout: I was in a great mood, had more energy, and felt much less stressed than I was before. Olivia agrees. "Infrared saunas can be even more beneficial for mental clarity," she says. "Many people say 'I feel so relaxed,' or 'I’m renewed!' and this is because infrared saunas boost your endorphins similar to working out." I already know from my hot yoga practice that adding a little bit of heat to your body can do wonders for tight and sore muscles. I always plan to take hot yoga after a class like spin or Pilates because of how much the heat helps ease any muscle soreness. You can expect a similar result while using an infrared sauna. Because the heat is reaching your muscles, joints, and tissues, you will feel your body relax and your muscles loosen. It's also a great form of active recovery; without having to really move much at all, you can still feel like you're doing something for your health. While there are still more studies that need to be done on the scientific benefits of infrared saunas, there are many frequent sweaters who consider the practice instrumental in healing many of their health issues. Jordan Younger, also known to her devoted Instagram followers as @thebalancedblonde, uses infrared saunas to help alleviate symptoms of her Lyme disease. Olivia's sister has also found healing properties in the infrared sauna. "My sister has Crohn’s disease and has healed her eczema and psoriasis by using the infrared sauna daily," she tells me. As long as your doctor says it's safe, there's no harm in giving it a try. As for me, I will most definitely be adding infrared saunas into my regular wellness routine. It's great to know there are other ways to reap the benefits of a good sweat, especially on those days where you're just not feeling a tough workout.